Our last update appeared after we had completed the sometimes stormy 1500mn passage through the Cook Islands from French Polynesia to the Kingdom of Tonga. We spent a quiet three weeks there relaxing before the even more demanding sail down to New Zealand. 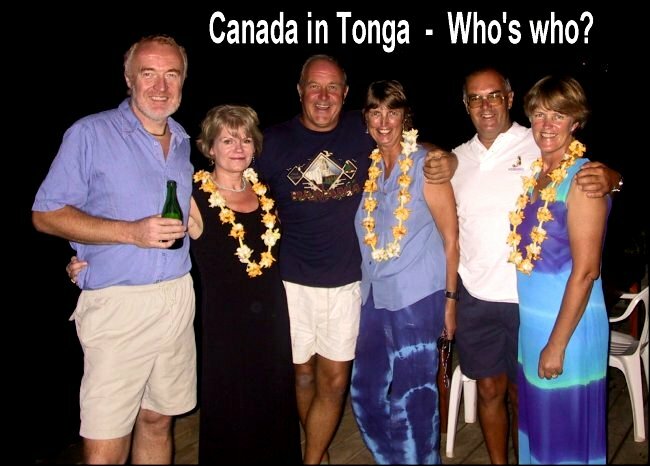 Tonga's northern Vavau Group is an agglomeration of low, wooded islands populated by charming people that fully justify the group's alternative name of the Friendly Isles. Warm waters and superb beaches shared with numerous friends from our floating trans-Pacific village made for a memorable stay. Amongst the attractions was a chance to snorkel down through the submerged entrance to a huge cave some 25m long containing a large air space. The surge of the swell outside made the air pressure within rise and fall with about a 5 second period. As the pressure dropped the air within the cave totally fogged reducing visibility to the odd metre. Suddenly within seconds the pressure increased and the whole cave was illuminated by the deep green light filtering through the entrance. The swim in required one to dive down around 3m for 20 seconds to an uncertain location so it was not the most popular destination thereabouts. By the time you have crossed nearly 7000nm of ocean from Panama you will probably have come across and got to know the crews of over a hundred boats and found a lot in common. One of these turned out to be shared birthdays early October. 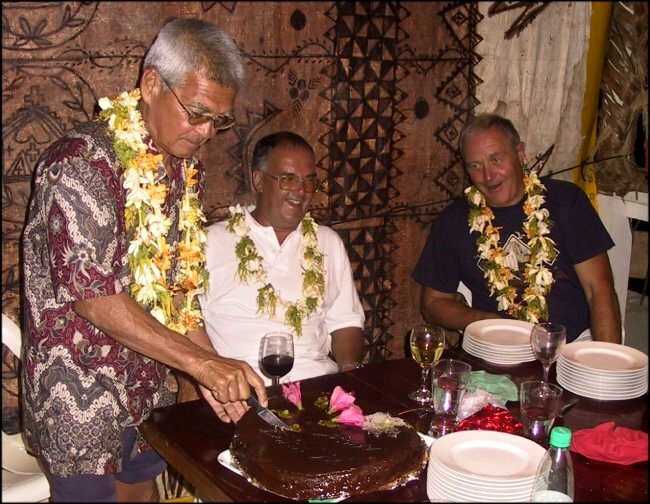 Here Ray of 'Tien Fe' from Singapore, Martin of 'Odyssey of Canada' and Dave share a birthday celebration in a Tongan restaurant, complete with cake and local dancing troupe. Even more of a coincidence was that Odyssey is British flagged, the Canada referring not to the country but the road Martin and Christine came from. You can imagine how surprised we were to meet up with cruisers from the same small hamlet in Wellow when we first met them in Tahiti. They had moved into Canada Road just about the time we departed in 1999 and left a year later, so we had never come across them until then and they had only heard of the crazy couple from down the road that had set off ahead of them. On the day of the birthday celebrations, there were lots, Martin & Christine were joined by Stuart & Mo, near neighbours from 'The Road', so a group photo was essential. Here are the six of us ready for a magic evening. The annotation on the picture was put there for posting on the board at the entrance to the lounge bar of our local pub, the Rockingham Arms. Another small world experience, all six of us from the same Wellow hamlet! Sailing legend rates the 1400nm voyage from Tonga or Fiji to New Zealand as one of the world's five worst sailing passages. The conditions change rapidly as one approaches 30°S, leaving behind the sub-tropical region of predictable high pressure systems moving eastwards off the Australian continent to the south of us. They are replaced by a sequence of fronts and troughs that guarantee sailors at least one beating-up on the way down. To make the most of weather windows determined from Kiwi HF radio fax forecasts, we broke the journey at North Minerva Reef, yet another of those amazing volcanic atolls that rise from the 3000m deep ocean bed to languish just below the surface of the sea. Like Beveridge Reef, this one was again about 2nm in diameter with a single, shallow, 50m wide entrance pass giving access to a relatively sheltered area in water depths of 15-30m. 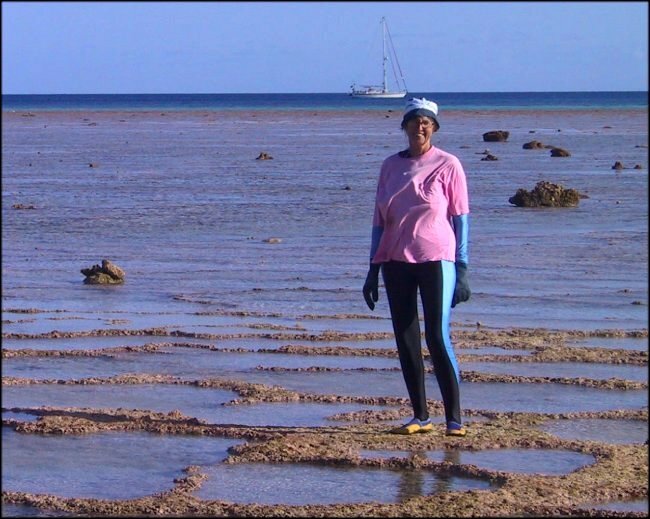 As you can see from the low tide picture below, the reef is only just exposed and that over only a small segment. Walking along that flooded moonscape one was preceded by numerous fish jumping from pool to pool ahead of us. We spent a very pleasant week there repairing sails and sorting out the boat after a somewhat heavy weather, three day beat down from Tonga. The water clarity was superb but again the more aggressive behaviour of the sharks made spear fishing difficult. By now we were taking them much more seriously after an encounter we had with four of them on Beveridge and a tiger shark attack on a Tongan local whilst we were there that nearly cost him a leg or his life. 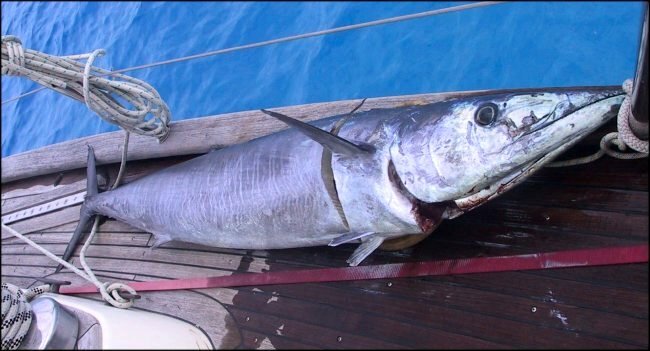 We did however get an over large wahoo (1.6m or 5ft long) which took a lot of getting rid of. That's the problem with ocean fishing, you catch nothing for days, then get more fish than you can eat in a month (Mike Richardson - eat your heart out!!). Leaving Minerva behind, we had our worst moments on the night of Sat 19th October with huge seas and green water right over the boat. However, within 36hrs we were on course again making 8+kts under full sail for the tip of the North Island. 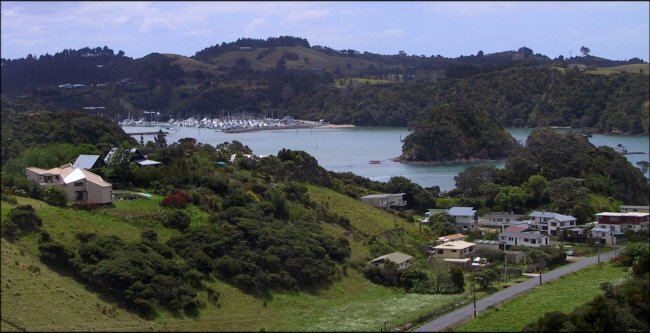 Throughout this approach to the northern shores of NZ we are monitored over HF-SSB radio and supported with weather info from a wonderful volunteer organisation manned by radio HAMs called Russell Radio. It was a great consolation to hear Des's voice twice a day, the only weather forecast we have heard which included an apology for what the elements were throwing at us. The run into Opua has proved notorious as sailors cross the commercial shipping lane in rough conditions about 40nm offshore. We had a near miss with a tanker which came out of the mist and rain to cross our bows but a couple of weeks later Alf, one of our Swedish single hander friends was run down by a Japanese ship sailing under a Panamanian flag of convenience. His boat was sunk, the vessel did not respond to the Mayday call and he was lucky to be rescued from a damaged liferaft some hours later by a Russian freighter. His luck held as it was bound for Tauranga rather than Vladivostock, so he was soon returned to the fold where we could collectively support him. Though the Japanese vessel has been traced, there is no sign of compensation so Alf is still relying on help from the cruising community. Our ordeal was over when we sailed into Opua at dusk on a beautiful Monday evening, tying up to the customs quarantine dock to await clearance next morning. New Zealand makes strenuous efforts to protect its borders against ingress of potentially infected meat and vegetable products, so the process next day bore little resemblance to the usual formalities (UK note!). Our arrival signalled the onset of a charmed period of welcoming family and friends visiting from UK as well as welcoming home each boat we knew as they thankfully reached Kiwi shores. Dave had ample opportunity to practice blowing the huge conch shell we had found in Cuba and tuned crossing the Pacific, to mark such ceremonial briny occasions. 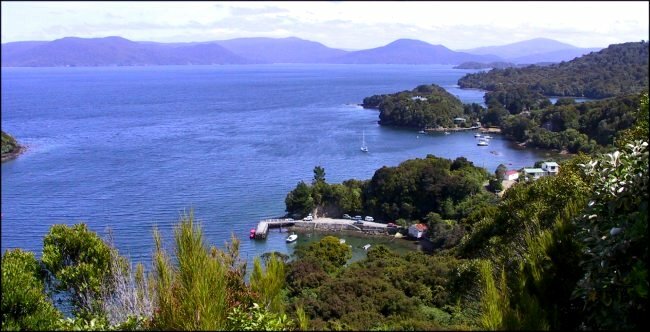 Opua is at the head of the Bay of Islands, a magnificent cruising grounds of islets offering superb vistas coupled with lots of good walking. Both our sons with their ladies came to see us in Oct/Nov as well as Di's Mum joining us for Christmas and New Year. We were also able to meet relatives over here, renewing some friendships and forging new ones. This has given us a great feeling of belonging as well as opening lots of opportunities to visit and host them back on Amoenitas. This is also a great place find bits and get boatwork done by a very skilled workforce at competitive prices. So, after bringing us over half way around the world so competently, Amoenitas was awarded a complete replacement of the standing rigging and a new mainsail and genoa. We also doubled the area of solar panels, rectifying what we'd considered the only significant omission from the original blue water cruising preparation done in the UK before we left. By the time early January arrived we were safely tucked up in the marina below at Tutukaka, raring to be off touring this wonderful country. Before we did, Dave managed to dive the Poor Knights Islands just offshore from there which claim to be one of the world's top ten sites. It was remarkable for the variety and tameness of the marine life but judgement on the exact rating will need to be delayed. New Zealand is an amazing country, tucked away in the Southern Ocean reaching right into the Roaring Forties. It stretches from 34°25'S at Cape Reinga in the sub-tropical north to 47°18'S at SW Cape on the stormy southern point of Stewart Island (770nm or 1430km long). It encompasses high snow capped mountain ranges complete with glaciers, deep flooded valleys in Fiordland, intact conical volcanoes, hundreds of large lakes, thousands of rushing rivers and the most unspoilt scenery of all but the most remote regions of the world. The unique native fauna and flora are varied and spectacular, being largely unaffected by the pollution accompanying the earlier industrialisation of the majority of developed nations. Added to all these wonders are the friendliest imaginable people, wonderful food and a remarkable can do attitude coupled with creative ingenuity and self reliance. All these attributes were much appreciated making us feel very welcome. This country has so much going for it, particularly if you value the quality of life more than the quantity. We'll start our update tour in Auckland, the biggest city by far but not the capital. It is probably the only place in the country one feels pressure of people and traffic approaching levels we are used to in Europe. The view above looking down from the Sky Tower onto the waterfront shows the Viaduct Basin, home to the Americas Cup yacht racing. When we arrived in October the Louis Vuitton Cup to decide who would challenge the Black Boat for the Americas Cup had just begun. We were able to follow the whole complex, protracted process through to to the sad defeat of the Black Boat by Alinghi from the best possible vantage point, in front of a TV screen. We felt very sorry for the Kiwis as the whole nation was behind the team and was visibly shaken by the outcome. In any other country it would have been a minor sport issue and had minimal coverage but here it meant everything. Though we enjoyed the actual sailing, glimpsed briefly between the copious commercial breaks that characterise Kiwi television broadcasts, it is a world apart from our passage cruising. Certainly, for that well known maritime nation, Switzerland to succeed with a cheque book campaign assembling people from 15 countries and relying on 6 key Kiwis to sail the boat was in stark contrast to New Zealand's stripped down, self reliant approach. 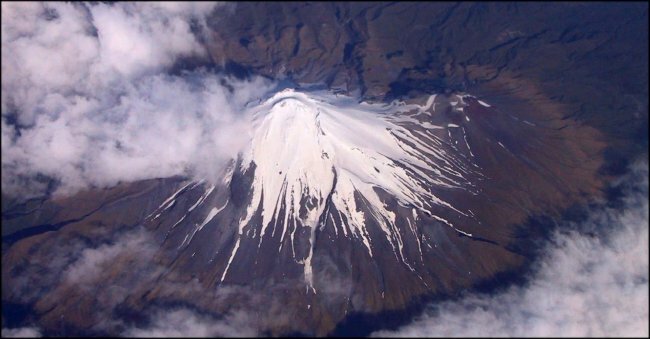 On our flight down to Christchurch for Christmas with Di's Mum we passed over the SW corner of the North Island and the Egmont National Park with its superb Taranaki volcano. It was fortunate we saw it then for when we drove by a couple of weeks later it was shrouded in cloud. This region is the latest part of NZ to be hosting a major film production with Tom Cruise and Billy Connolly, et al there for three months filming Samurai, a Japanese story. With all this superb, largely unspoilt scenery it is a natural choice of backcloth for such films as the Tolkein trilogy and that lovely local story, Whale Rider. Scattered throughout the countryside are evocative formations of rock with stupendous backdrops just calling out for a suitable plot, just like the ones below. These are known as Castle Rocks, a mass of large karst limestone cliffs and rocks. covering several square kilometres. 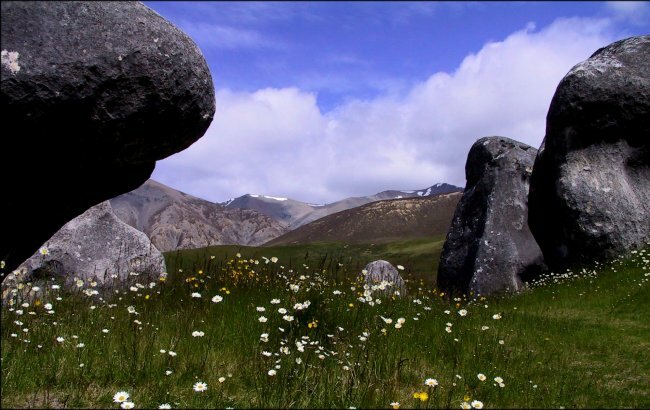 This springtime view through to the distant snow covered Southern Alps was captured on one of our yuletide forays which took us up to Arthurs Pass, the central of three passes crossing the mountain divide running down the South Island. . This area of NZ is host to a mass of high mountain ranges which makes driving there a constant pleasure as they seem never to be out of view. Even in mid-summer snow falls on the summits, further enhancing the magic of these majestic ranges. Above is a view in the spectacular gorge that leads down from the north of the South Island to the west coast. 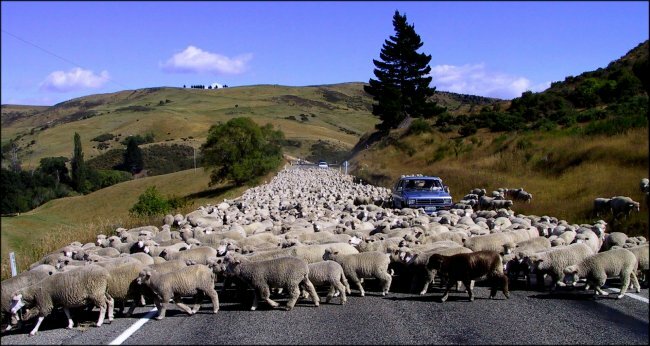 By this time one has gained a tremendous respect for the Kiwi road builders who have created a superb rural network, much of it through the most challenging of terrains. It is even more impressive when one takes into account that these extensive, high quality roads were created in such a large country by such a small population. Equivalent when they were constructed to the population of Southampton funding all the major road network of the UK. Not only are the roads well built and maintained but outside the major centres of population they are virtually empty. You will see below an unusual 'Mainland' congestion of three cars within view at the same time, due of course to special circumstances. A new agricultural survey has just shown that the national flock is only 10 sheep per head of population, down by a factor of two on the numbers of a decade ago. Everywhere one travels, natural wonders abound throughout. the land. These eroded rocks on the exposed Tasman Sea coast form striated formations of pillars and caves that extend for around a 1km square. As with all such Kiwi natural splendours, they are beautifully signposted, explained and presented by the Department of Conservation with superb paths, bridges and walkways. 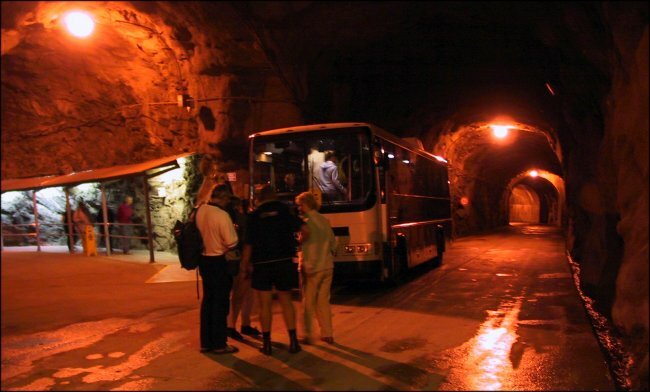 At Charleston, just south of Westport is the Metro cave complex with an underground stream feeding into the Nile river running through the Paparoa National Park. This was to be the scene of our first exposure to the 'Fearsome Foursome'. 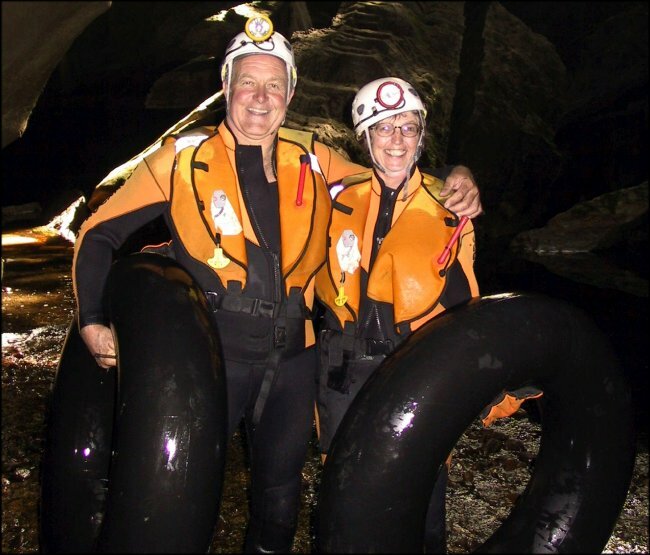 NZ prides itself on adventure experiences, so called black water rafting through caves being one. The others are white water rafting the fast river gorges, jet boating and bungy jumping, a simple exploitation of gravity pioneered here. The later was proscribed by Di on what she claims are good medical grounds, so that left three. We first ascended the river valley by train, then after kitting out in full wetgear with helmets, climbed up a 120m cliff carrying our large inflated inner tubes. Then began a walk of around 2km through the most beautiful of passages covered by every type of exotic calcitic formation. When eventually we attained the stream it was onto the rings and after a few hundred metres paddling on our backs, looking up at millions of glow worms, out through into daylight and an exciting 'bums-up' rush down the rapids to where we started out (protruding bums encounter equally protruding rocks). Travelling south down the coast we visited the Franz Joseph and Fox glaciers before crossing the Haast Pass, the most southerly way over the Southern Alps. On our way to Fiordland lay the tourist mecca of Queenstown. 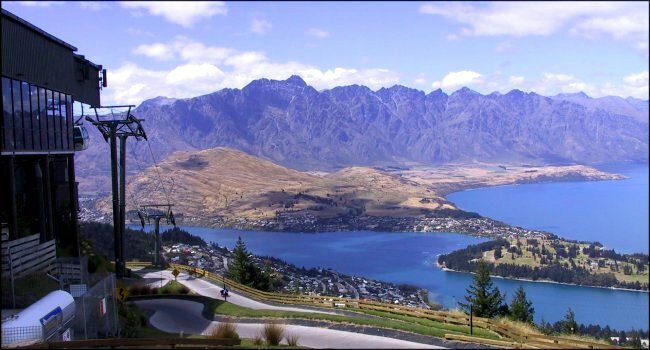 Crowded and over commercialised, it is not our favourite Kiwi destination but the view from the summit of the overlooking hillside was well worth the trouble. As befits anyone choosing to sail around the world, we insisted on doing this trip the hard way too by climbing up and descending in the gondola. The splendid range of mountains behind are quite naturally called the Remarkables. 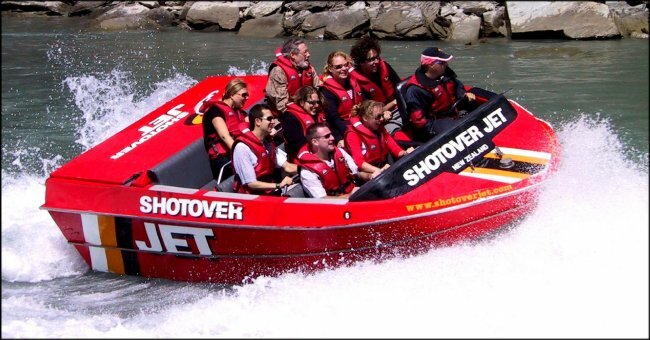 This area claims to be the adventure capital so it was time for Fearsome Foursome number two, another NZ innovation, the jetboat. Very fast (up to 80km/hr) and extremely manoeuvrable, they career around shallow river beds and between steep sided ravines, disconcertingly performing multiple 360° turns and sideslipping inches from vertical rock surfaces. Great fun but not an experience one needs more than once a lifetime. 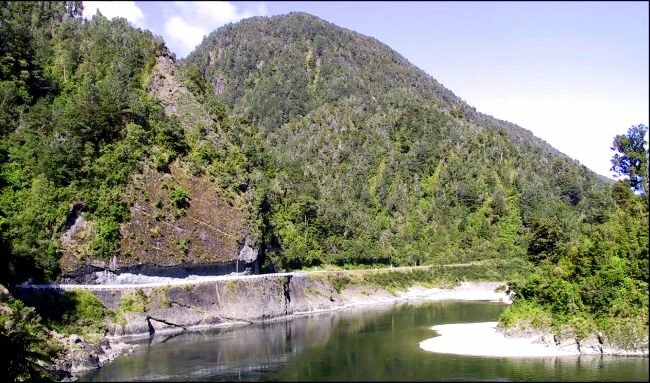 Our route now was into the magical region in the far SW known as Fiordland, famed for steep sided U shaped valleys and scenery of breathtaking splendour. Places like Milford Sound below are crowded with visitors but nothing can diminish the grandeur of natures glacial creation. Apparently these extreme features are only made possible by the exceptional strength of the local granite which manages to sustain such huge steep sided structures. This morning view below is another one of these electronic 'stitchings' of four images and shows off the reflections in the early morning calm (pity it wasn't high tide too). 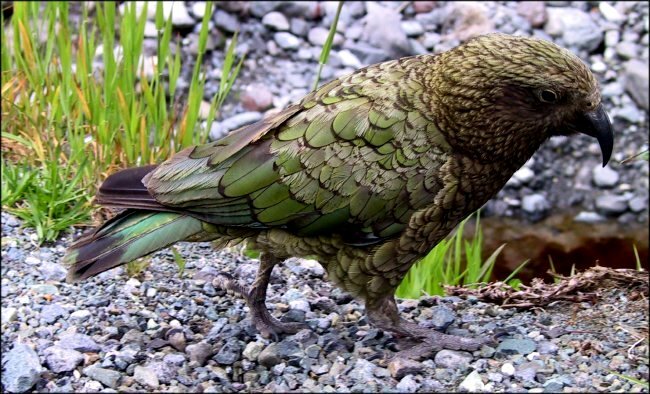 Around the Fiords are found the beautiful but trying kea birds. This native specie is every match for the tourist, destroying everything it can get its beak around. All these wonders are not viewed without some discomfort though. NZ, in particular the South Island and especially Fiordland are home to some of the most annoying and persistent insects on the planet. Known locally as sandfly, they are similar to the blackflies of backwoods Canada and nonoes of the Marquesas of French Polynesia. They can make any outdoor activity a nightmare, the only recourse being to covering up totally from head to foot. South Island is blessed by mountains, lakes and a plentiful supply of water. The high peaks of Fiordland cause the prevailing moist SW winds off the Tasman Sea and Southern Ocean to dump up to 7m of rain annually (that's over 250" or about ten times what we were used to in Hampshire). So its an ideal place for hydroelectric power. We visited the Manapouri power station by a boat trip of 20km across the lake and a ride by coach into a 2km spiral tunnel winding down 180m into the granite to the huge machine room. It is an amazing and fascinating story of achievement. Most of the 750MW from this station is carried by pylons, 180km south to the aluminium smelter at Bluff where bauxite ore from Australia is processed. 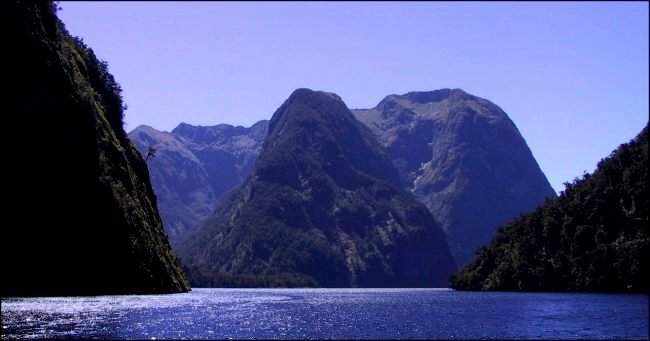 The scenery on the voyage out into the Tasman Sea from Deep Cove along Doubtful Sound is stupendous with sheer sided peaks with hanging valleys and many waterfalls. Again as in Milford Sound we saw many dolphins, seals and sea birds. The sound was named by Cook who was uncertain from his vantage point offshore whether there was a tenable anchorage. The weather was inclement and the entrance must have looked unpleasant with the many offshore islands and reefs. Further south at Bluff, the most southerly town we took the opportunity presented by relatively settled sea conditions to make a crossing to Stewart Island, the most southerly point of NZ. It is a delightful haven of tranquillity, in good weather at least. It would have been nice to have spent several days exploring on foot but we had friends with us on holiday from the UK who had more pressing timescales. Heading north again we passed through a charming unspoilt area on the SE coast called the Catlins. It was our second visit as we had to rush away before to meet up with more friends. Anyone in the far south of Kiwiland should make every effort to enjoy the area before it gets developed. 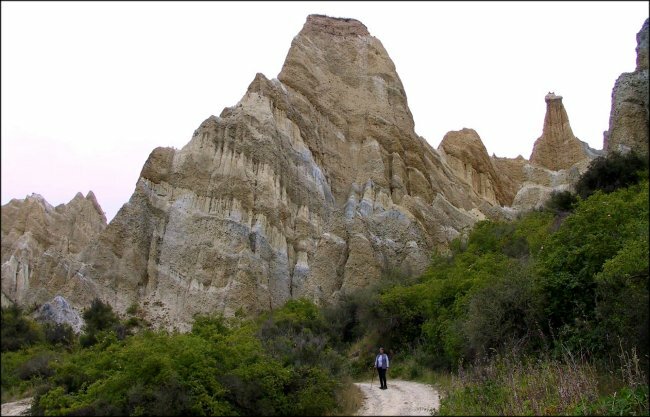 Up in the central region of the South Island we came across this impressive formation of eroded clay cliffs. We also met a keen hang glider pilot nearby who introduced us to a Fearsome Fifthsome. No not jumping of mountains exactly but driving his 4WD vehicle back down a frightening, zigzagging track from a 1700m peak. The narrow twisting track up the around 70° incline was so rough that Di was encouraged to sit on the floor in the back on the way up to maximise stability. You can imagine her horror when she saw the route down. We made it safely but but both felt we would rather have jumped off for the first time rather than return down that hair raising mountain side. 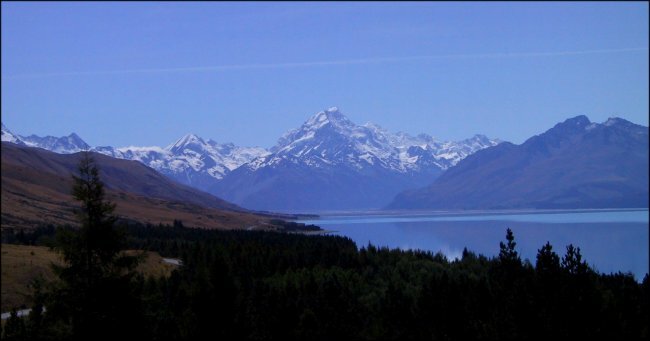 We had strayed into that area to view the most impressive area of the Southern Alps where they form a magnificent backcloth to the azure blue waters of lakes such as Pukaki and Tekapo. Mount Cook and Mount Tasman stand supreme, looking the every bit the way any climber would want. Sadly for Dave, these peaks are not approachable, (for him at least) as the conditions and rapidly deteriorating weather render them amongst the worlds most difficult climbs. Having found an off road replacement for bungy jumping, that left one more Fearsome experience to make up the quartet. 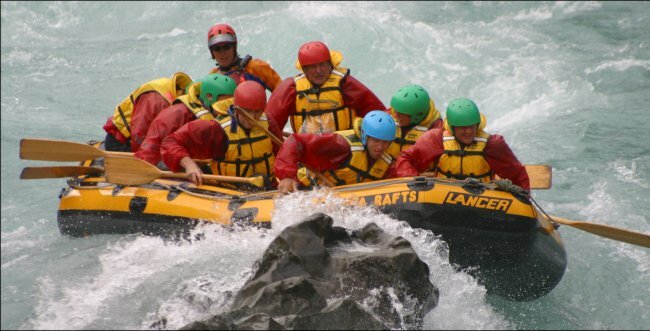 This came with a Grade 5 river rafting opportunity down gorges on the Rangitata river just south of Ashburton. This was just downstream from the site of Edoras, the hilltop fortress in the Two Towers film. Dave can be seen in the upper mid section of the raft, with a red helmet, enjoying every minute. Well, up to that point at least. Within seconds we were pushed up onto the rock in the foreground, all eight of us ending up in the torrent. Being in raging water travelling at about 20km/hr between sheer cliffs put quite a different complexion on life. Still, we all survived, made to other rafts and some of us even thought the event even enhanced by the excitement. Di did not participate, she maintains she has had enough excitement sailing here! Forging toward a rock on the last 'Foursome' but not without consequence! Our long tour of the south was a fantastic experience. We marked our route on a map of the Mainland, only to discover we had covered all of the main road system, other than a small length of the east coast near Timaru. Still, we intend returning again next year so have left at least one unturned stone. We had also revisited relations, made contact with some of their friends and managed to meet up with two lots of friends over from UK on holiday. Quite a summer! We leave you as we usually do with a warm glow. This scene looks over Buscot Station, one of the friendliest places we stayed on our travels. Our lasting impressions have been not just of a staggeringly beautiful country but of a people who must rank amongst the most hospitable and helpful anywhere. Our priorities now are centred on getting Amoenitas ready for sea again after a long sojourn from sailing. There will be an opportunity to cruise the Northland shores again for a few weeks before we head back north to the tropics around mid-May. Conditions permitting, the plan is to return to Tonga, making our way up to Samoa and maybe straying east again to cover an atoll called Suwarrow in the Northern Cook Islands. The big attraction before returning to New Zealand in November is Fiji where there is an enormous area of atolls and islands to explore. We must admit that, as Kiwiland becomes cooler and darker with the onset of the southern autumn, the thought of warm, clear tropical waters becomes a powerful magnet.